Food reviewing is always so subjective as it depends on personal tastes, and if there are products that I really didn’t enjoy the taste of this month, it doesn’t mean that they are bad, it means they’re just not for me! As you will know (if you read my blog regularly that is!) that I love food subscription boxes, and a new one has hit the market called TasteBox by EarlyBird. What makes it different from other snack boxes on the market is it’s designed to be a festival in a box, and as well as containing great snacks, each TasteBox comes with an illustration from an up-and–coming artist and a free download from emerging bands and DJs. They’re designed to make Monday’s feel better! (Boxes are despatched on a Friday and received on Monday) Each TasteBox contains five healthy snacks and unusual teas, and is delivered to your door on a weekly, fortnightly or monthly basis. The contents of each box can then be tailored using the ‘love’ and ‘hate’ preferences on your online account, ensuring you get a box full of healthy treats you know you’ll enjoy. Snacks will remain fresh for 7 days, so it’s best to consume them within this period. I’m going to be sent a box each week for the next three months so that I can try out a wide range of the snacks that they have on offer. The snacks come packed in little bags, which I have to say that I found really tricky to open. I ended up cutting the top off with a pair of scissors. The bags of snacks are all snuggly packed inside a colourful hexagonal box, which does fit through a standard letterbox so you don’t have to be in the accept your TasteBox. As well as the snacks, there are also two teabags the side panels as you can see in the photographs below. Bollywood Sticks (160 cals) – a mix of noodles, lentils and Indian spices, with roasted peas and chilli and zesty lime cashews. Minted (181 cals) – pecans combined with mint sultanas and dark chocolate. Milky Berry (70 cals) – cranberry mixed with blackcurrants and white chocolate. Rose Is Nuts (176 cals) – peanuts mixed alongside almonds and cashews with a sweet rosemary coating. Yogi Beary (155 cals) – walnuts mixed with yogurt-coated raisins, dried strawberries and golden raisins. I liked the names of the snacks, and the different mixes too. I wasn’t a fan of the Minted, it just didn’t seem to gel well together for me, so I’ve marked it as “hate it” so that I don’t receive it again! Beatnuts and Berries (191 cals) – flame raisins mixed with peanuts, sunflower and pumpkin seeds, cranberries, hazelnuts and almonds. Brownie Crumble (82 cals) – brownie crumble biscuit, with a rich cocoa taste. 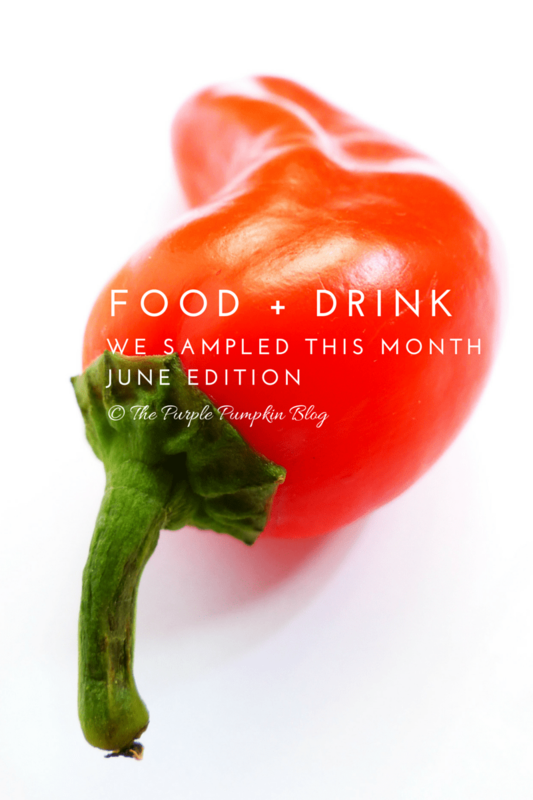 Chilli Lime Shot (82 cals) – jalapeño chilli and kaffir lime pumpkin seeds. Essential Nutty Remix (204 cals) – peanuts mixed with hazelnuts, brazil nuts, cashews, almonds and walnuts. Nuts About Ella (175 cals) – roasted hazelnut mixed with milk chocolate drops and sultanas. I wasn’t sure if I would like the Chilli Lime Shot, but was pleasantly surprised when I did! Not over firey, and there were lots of pumpkin seeds in the pack to nibble on. I found the Brownie Crumble to be a bit dry and bitter for my taste. Here are the tea bags… they’re so pretty! I haven’t drunk them all, and I can’t remember which is which now… but the tea that I did try was delicious, and made a change from the regular builders brew I tend to have during the day! 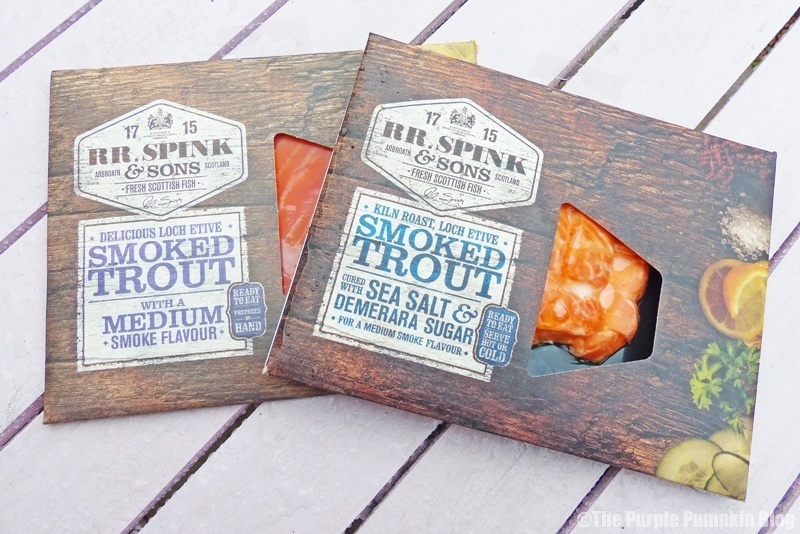 RR Spink and Sons; a sustainable Scottish smoked trout producer who are celebrating their 300th anniversary this year! Founded in 1715, RR. Spink & Sons is among the UK’s oldest and most prestigious food producers and the proud holder of a Royal Warrant as Fishmonger to Her Majesty Queen Elizabeth II. Made with the best quality ingredients with no artificial additives, and is prepared by hand in Scotland. All of the products are ready to eat or cook, so you don’t have to spend time messing about with your ingredients (unless you want to, that is). And to make things even easier, it’s boneless and hugely versatile. You can find stockists of RR Spink and Sons fish products online on their website. There are several different flavours you can choose from including Whisky smoked, and warming winter spices. I was sent a pack each of smoked trout with a medium smoke flavour, and smoked trout cured with sea salt and demerara sugar. Since we were having the family over for lunch, I decided to go full on retro and make some simple canapés using the slices of smoked trout, spread with some cream cheese and herbs, and then rolled up. I used the final pieces that were not long enough to roll up on pieces of Melba toast, topped with cream cheese, the trout and a piece of cucumber. The flavour of smoked trout is not as strong as smoked salmon, and the empty plates indicated that everyone enjoyed the canapés! I created a salad plate with the cured trout, which had a fabulous flavour, not overly sweet, but just the right amount of salt and sugar. The fish was meaty and went well simply with some salad and buttered crisp breads. We have been buying Kallø rice cakes for years – they make a great snack, and can be topped with lots of different things, both sweet and savoury! Kallø are just about to expand their range into the children’s food world with their Kallø Kids Milk Chocolate Rice Cake Minis. Ideal for sweet lunch time bites or afternoon snacks. These new rice cakes are a great alternative to high sugary and fatty snack foods for children. They contain no artificial colours or preservatives and are also coeliac friendly. These didn’t last very long in our house! The pack contains 6 handy on-the-go packs that you can easily pop into lunch boxes, or into your bag for a day out. They are topped with a thin layer of delicious milk chocolate, just enough to give a nice sweet kick, but not so much that you feel guilty eating a whole pack ;) I’ll be looking out for these next time we go shopping for a picnic! Priced at £1.89 per pack the rice cakes available in Tescos and Waitrose. Disclosure: I was sent these products to review. All thoughts are my own honest opinions. i love food parcels , its great to be able to sample all new products. It’s a great way to sample new products, we love getting them!